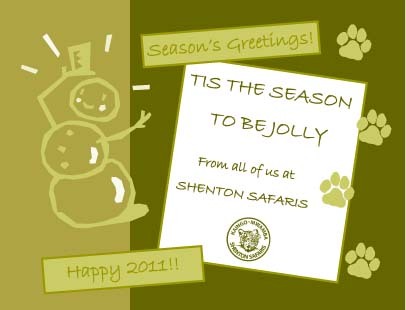 Shenton Safaris wishes you a joyous Holiday Season! … to let the rains come and the rivers flow. Indeed it is that time of year again where most of our staff has gone home to their families, tending to their farming duties. Where Derek and Jules have headed back to the city along with Saphire who is enjoying the company of her school friends. Where both camps have been packed up and the land given back to the leopards, lions and all the other wild animals to roam in freely. Where the rains come in cloudburst and fill rivers, lagoons, and plains. … to close down Kaingo and Mwamba for a few months, and to think about next season. And no worries, we are already busy planning renovations and enhancements, and happily taking reservations for 2011. All of us at Shenton Safaris would like to take this opportunity to wish you all a joyous Holiday Season and a happy, healthy and safari-filled New Year. We are grateful to all our guests, our staff and our business partners who have made our continued success possible. TIS THE END OF THE SEASON!